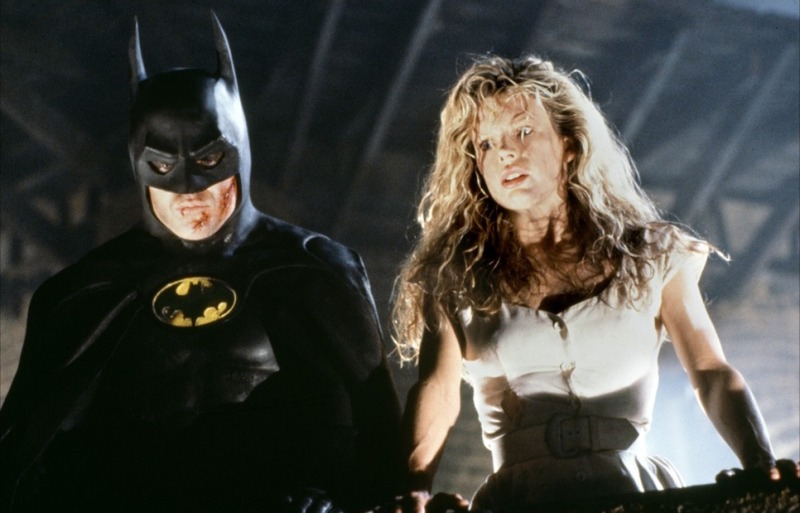 The film that reignited interest in the adaptation of comics to the screen, Batman is a curious mess. An engrossing dark visual aesthetic is ultimately wasted on a miserable story that simply runs out of script. In Gotham City, a mysterious giant bat is terrifying the city's muggers. Newspaper reporter Alexander Knox (Robert Wuhl) is keen to get to the bottom of the story, and is soon joined in his hunt by famous photographer Vicki Vale (Kim Basinger). The batman is actually wealthy businessman Bruce Wayne (Michael Keaton), out to counter the crime wave sweeping across the city. Vicki and Wayne are soon having dinner and falling in love. Meanwhile, the criminal masterminds who control mayhem in the city are having a war of their own. Mastermind Carl Grissom (Jack Palance) attempts to get rid of his partner Jack Napier (Jack Nicholson). Napier is double-crossed in a set-up, and drops into a vat of chemicals. After a botched attempt at plastic surgery, Napier transforms himself into the hideous Joker, a mad villain stuck with a wicked smile, pasty white skin and coloured hair. The Joker gets his revenge on Grissom and unleashes his fury on the citizens of Gotham City, but finds Batman in his way at every turn. Filmed in the midst of job action by Hollywood writers, Batman's first half holds together but the back end disintegrates into what can only be described as a narrative farce. The characters are abandoned in their outfits, almost literally wondering what to do next. Some supposedly high profile characters, notably Billy Dee Williams as district attorney Harvey Dent, struggle to even justify their existence. When the Joker gets ready to unleash deadly gas from balloons, Batman spends an eternity inexplicably zooming around the sky in his Batplane, doing an excellent imitation of a test drive for a new toy just long enough for the Joker to start causing carnage. But the disaster is complete during an endless climax that starts in confusion and ends in disarray, the Joker forcing Vicki to climb the stairs of a cathedral for the purpose of...dancing with her? Batman gets real close to demonstrating "make it up as you go along" right on the screen, and at a total production cost of $48 million. With no coherent story to tell, director Tim Burton fills his imagery with Jack Nicholson, the Joker stealing the movie from Batman. While Nicholson is initially undoubtedly entertaining with his boyish devil charm, in this case too much of the Joker is not a good thing. Nicholson's ugly mug and irritating laugh are overexposed to distraction, his demeanour quickly growing tiresome rather than menacing. In comparison, Michael Keaton's Batman is plain and boring, the feeble attempts to link Jack Napier to Bruce Wayne's childhood agonies missing the emotional mark. The supposed romance between Bruce Wayne and Vicki Vale equally rings hollow, and appears driven by nothing except the requirements of the half-baked script. Kim Basinger does little to convince anyone that she is a celebrated photojournalist. 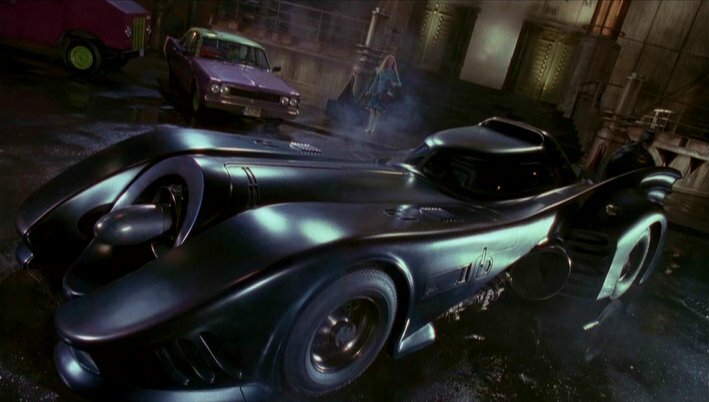 Burton does score all his points in delivering a stunning visual style to Batman. The mythical Gotham City is industrial revolution meets steam punk, a place where the sun never shines, the buildings are all black, and everything is both imposing and just slightly askew. The costumes and set designs are memorable, and the Batmobile is an impressive piece of indestructible machinery. Given that all the action takes place in the absence of natural light, Burton does well to maintain clarity during the movie's more hectic kinetic moments. Despite its weaknesses, Batman created the template for releasing, marketing and capitalizing on the in-built audience for comic book adaptations, a franchise-creating formula that has lasted for a generation. Comics fans will always flock to see their superheroes graduate from motionless panels to moving pictures, but even the best heroes need the help of a meaningful plot to truly soar.